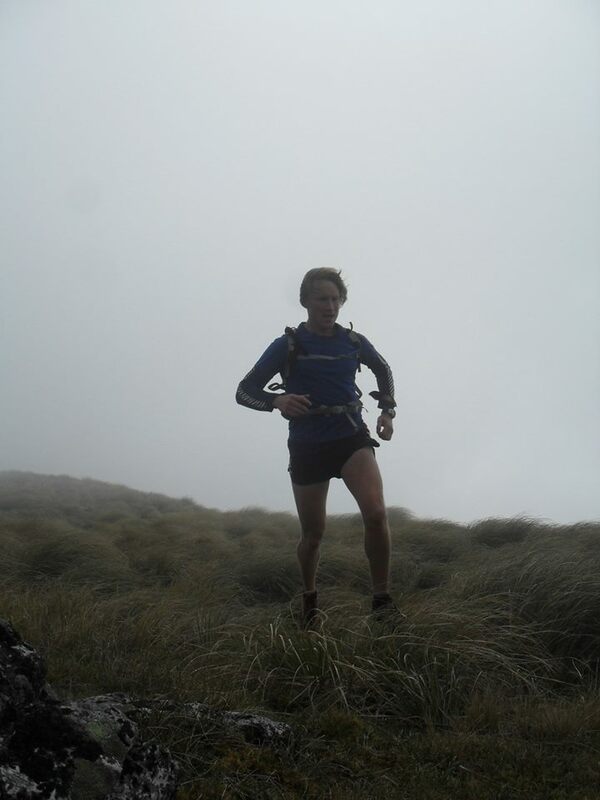 On December 21st, 2013 Laurence Pidcock and Chris Swallow took on the might Tararuas and the famed SK Traverse. Starting at Putara Rd and finishing at Kaitoke, the traverse ticks off numerous peaks and huts along the way and has been a test piece for the Wellingting tramping and running community for years. Below is Laurence and Chris trip report, written by Chris. On this day two years ago a double Southern Crossing, last year a long run down the Southern Main Range; so a SK attempt seemed a fitting way to spend another December 21st. Inspired greatly having read solo accounts by names such as Camden, Goldsworthy and Thurlow, it was the ‘travel light, travel fast’ approach of Colin Rolfe and his 22 hours 59 minutes record traverse that enthused us most. A 24 hour schedule was drawn up, support parties mustered and we found ourselves rising to a 2am alarm in Tawa College’s ‘rural classroom’ (big thanks to caretaker Vince and principal Murray for the use), a quick brew and some honey bread before heading off to the Putara Road end for a 3am start. Jamie Stewart accompanied us for the first leg and we were soon layering into windproofs on Herepai’s flanks. Good time made across to West Peak where head torches went away and an extra layer went on as we trotted south down the Dundas Ridge, feet in the clouds and a firm wind on the right cheek. Jamie said his goodbyes at the Dundas Hut turn off and off we headed up Dundas Peak. The next short section from Dundas to Pukematawai was the only section of the route we had not reconnaissanced – this proved costly. Eagerness, not trusting a compass, blundering on with an error – not exactly fine mountaincraft. We had followed a loosely cut side track and diverted off Brocket Rocks and over Triangle Knob. My assertion that ‘this must be right as it’s the only track around here’ caused me to lose a hastily gambled chocolate fish. I swore heavily as we re-climbed Dundas and found the correct route off towards Arete – now 2½ hours down on our 24hr schedule. Laurence murmured something about, “probably never wanting to give this another crack, ever again,” and so all was quiet once more, except for the incessant wind. An out and back up Kelleher was a lapse of concentration by all, and we continued on with yet more cursing into the wind. Farewells to Al in the strengthening clag and wind on Nichols and we pressed on up Crawford towards Andersons chasing the hope of a hot brew. Looming out of the mist on their way back to Junction Knob we found Paul Helm and Jackie Holley. With delight we heard them bellow above the wind, “Fire in hut, billy of hot water on top, good luck!” The respite from the miserable weather was lovely, but we could not allow ourselves to settling in for too long… Refuel and refill with the supplies, and back out into the bush and onwards towards the goal once more. Back into the wind up Kahiwiroa and non-verbal communication prevailed. Aokaparangi summited, careful in the clag; I recalled having gone wrong coming off here previously. Wright, Simpson, and the temporary solace of Maungahuka Hut loomed beside the tarn. Cold hands were watched very carefully so as to make sure they maintained full contact with ‘the ladder’. They had been playing up lately, swollen and a lot less willing to obey my command. 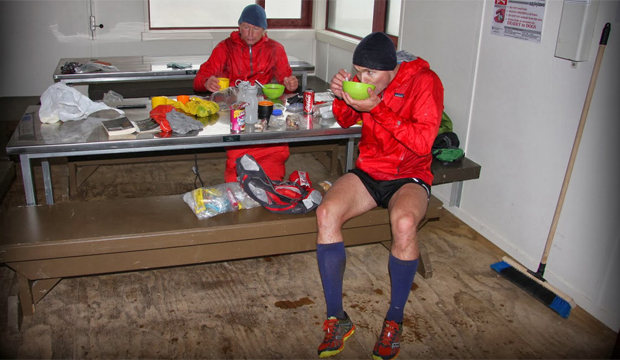 Our food cache was obvious on the track just after The Peaks, kindly brought down by mess’rs Chris Martin and Tom Crumpton. Climbing McIntosh and the first few drops of rain began to smash my right cheek, borne on that unforgiving wind that I had grown accustomed to. We weren’t friends just yet, but our acquaintance was deepening. Yeates, Vosseler and now the rain came on with even more fury. Unsure up Bridge, hoping it was the last climb of this ridge and then a warratah and a 2nd and the short descent before the rise to Bridge Peak. Compass out (trusting it once more) and a bearing cut the dog leg out for a direct line to the new Kime Hut. In the few seconds Pawel and Donna realised we were serious about racing the darkness to Alpha they questioned us not once and a focused activity frenzy had us a hot brew, hot broth, a sleeping bag round pink legs, packs filled and an extra layer loaned. Fabulous stuff. Leaving Kime on a bearing up Field Peak to cut the corner off and experience as much speargrass as possible. It was hammer down over the tops just to keep warm; horizontal rain pinging off bare legs and cheek, loud challenges bellowed at the weather in meagre defiance, keep following the obvious foot-trail to the sheltered relief of the Alpha Peak descent into the bush. Candles alight in the hut with a welcome from Damian Clarke and Maria Heine. Hot brew, chips, chocolate and out quick across Hell’s Gate. A mantra formed and decreed in the quiet of the bush, able to think better now, mind free from the weather and it’s imposition of that one, singular ‘just keep moving’ thought: no injuries, focus on the foot trail, scan for the orange markers, keep eating, keep drinking, don’t lose the track, think not of Kaitoke but the next landmark. Hell’s Gate, tick. Bull Mound track, check. Omega, done. Block XVI. Stick to the mantra, focus, eat, landmarks, focus, eat, landmarks: that long steep descent, that huge bog I nearly drowned in, those two climbs that are exposed to the west, the turn off the ridge, the switch backs down into the bush, that tree fall, the old Dobson’s hut site. Down through the bush, the grey clay track rises out of it and a familiar noise sees me fumbling for my phone and the sweet voice of girlfriend Jennifer on the other end – she’s stood by my car at Kaitoke with Laurence’s missus Shailie, great news! But not there yet, next landmark the yellow writing of the Alpha Hut sign, turn right, the downhill, then that flat section and the left turn and down into the bush once more on the steep and eroded descent to the YMCA Camp Kaitoke where my car was left. My mind concedes for the first time that we’re nearly done and this minor relent floods my legs with all the pains and sores, niggles and limps, that had been subdued and stored far away for many previous hours. The walk across the grass, a handshake, waiting cars, open arms, whoops of congratulations, weighing scales and no more running for a while… The time was 1:12am, 22hrs 12mins since we had set off from the Putara Road end, all those ages ago. Putara-Kaitoke. Done. A big thank you to Laurence Pidcock for his companionship and compatibility in both fitness and mentality. Further thanks to all the people mentioned in this account for their support and camaraderie on a testing day in the mountains.